Twin City Fan works closely with a large number of OEMs that manufacture Car Wash systems. We offer complete fans as well as a variety of parts including wheels, cones, drives and inlet plates. Dryer fans are typically built with 10 HP and 15 HP motors in 50/ 60 HZ ratings. Nominal 18″ diameter BCS steel wheels with 12-blade construction are generally used to minimize objectionable “pure” tones that can be irritating to the human ear. We also offer Type BAE aluminum wheels using all welded extruded blades when a customer prefers aluminum rather than steel wheels. Dryer fans are commonly mounted on the sides and top of arches located at the exit section of a typical car wash installation and are generally constructed from a high density plastic material to prevent corrosion. The special projected mounting of the inlet cone to the housing offers higher outlet velocities, which allows for faster drying times. We also offer special plastic nozzles to obtain yet higher velocity air for optimum drying. 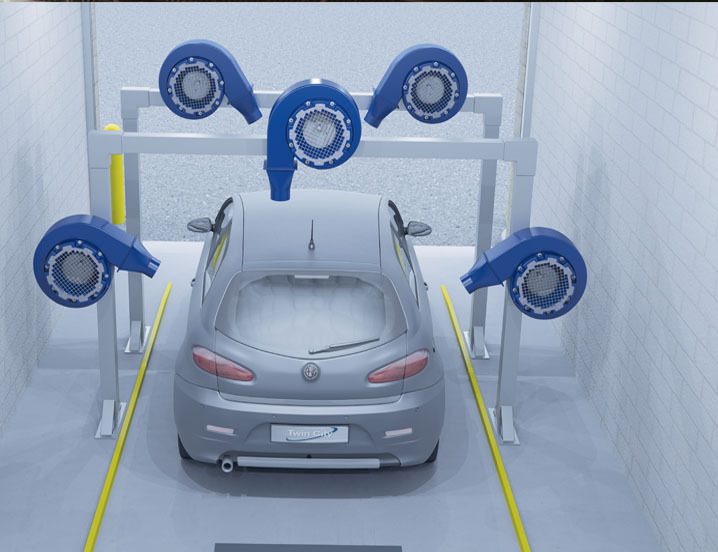 Twin City Fan has become a leader in the Car Wash Dryer market and is known for supplying high performance fans with unmatched durability and reliability.